Adam Seymour went on to be the guitarist in The Pretenders for a good long while. Indeed there is another album, their self titled debut released in 1990 and also on Reprise. I've got a vague recollection that in addition to this track 'Girl in a Jigsaw Puzzle' was also released as a single from this album but the only other single I have is 'Seesaw' a track from Shangri-la. Incidentially the acoustic version of Lights Out (Read My Lips) from the cd single is well worth a listen. I've got this 7 inch somewhere, but I've probably not heard it for at least 15 years! Like yourself, I know nothing about them, I'm afraid. Susie Hug went on to play with The Blue Aeroplanes in the mid '90s. The conections for all this stuff is Sermon Mgmt who looked after The Mighty Lemon Drops..Susie Hug I think worked in the office & went out with Adam who did go on to play with The Pretenders for a long time. Sermon then took on The Blue Aeroplanes & Strangelove hence the links. The connection here is Sermon Mgmt who at the time managed The Mighty Lemon Drops...Susie Hug (who is american) I think worked in the office & went out with Addam who did go onto to play for The Pretenders. Sermon then took on The Blue Aeroplanes & Strangelove hence all the band members overlapping. Just found this post, but remember hearing that Susie Hug was working on some kind of solo album with Fran Healy of Travis...he's apparently a big fan. Not sure if it ever came out. 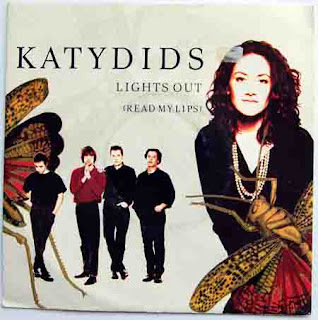 That first self-titled Katydids album was produced by Nick Lowe and was a nice little record.